You have heard of Rodgers and Hammerstein. Have you heard of Kern and Hammerstein or Romberg and Hammerstein? If not, this CD will interest you because it starts with Hammerstein’s collaboration with Sigmund Romberg (1887-1951), progresses through his partnership with Jerome Kern (1885-1945) and concludes with his early years as the lyricist for Richard Rodgers (1902-1979). Oscar Hammerstein II was born in New York on July 12th 1895 and died in Doylestown , Pennsylvania on August 23rd 1960. Oscar came from a famous theatrical family. His grandfather, Oscar Hammerstein (1847-1919), was a celebrated impresario who built several opera houses and theaters in the USA, and his father was a theater manager. Young Oscar “studied law at Columbia University and graduated in 1917, but the family call was too great, and having acted in several university shows, he abandoned the law and became a stage manager for his uncle, Arthur Hammerstein. He began writing for the theater, producing librettos for several minor shows 1920-1922. He wrote many of his first lyrics in collaboration with Otto Harbach, as in Romberg’s 1926 Broadway musical, “The Desert Song”. 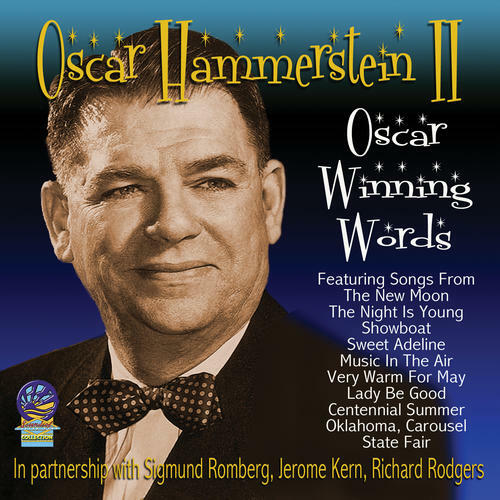 Two years later, Oscar was the sole lyricist for Romberg’s musical play, “The New Moon”, and graduated with enourmous success through collaborations with acclaimed composers Sigmund Ronberg, Jerome Kern and Richard Rodgers.